Passed G.C.E. O/L and minimum 2 passes in G.C.E. A/L. Experience in insurance industry will be an added advantage. 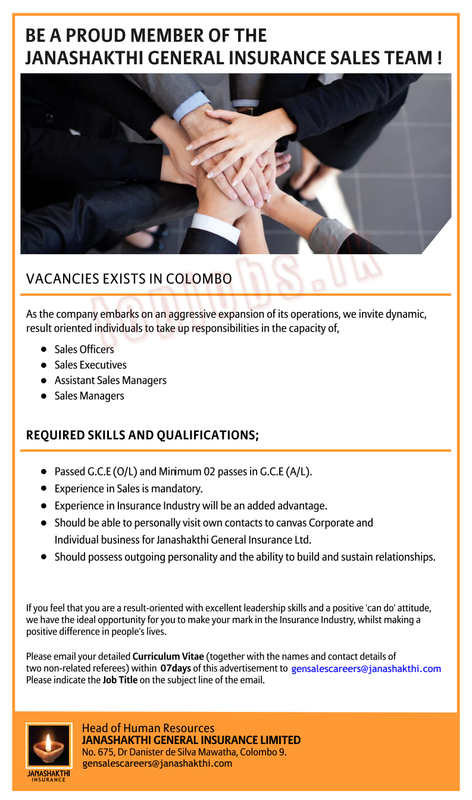 Should be able to personally visit own contacts to canvas corporate and individual business for Janashakthi Insurance Ltd.
Should possess outgoing personality and the ability to build and sustain relationships. If you feel that you are a result oriented with excellent leadership skills and a positive ‘Can Do’ attitude, we have the ideal opportunity for you to make your mark in the insurance industry, whist making a positive difference in peoples lives. Please indicate the JOB TITLE on the subject line of the email.